Do you have an important message to share? Would you like to create a podcast but don't know where to start? This quick A to Z Guide to Podcasting explains everything you need to create, record and share your very own podcast! It is designed to familiarize you with the basics of podcasting, and break down all the technical stuff from recording to posting. You will get a quick step by step video course full of tips and tricks to create a successful podcast. Avoid common mistakes when buying podcast equipment and launching your show. Learn at your own pace, from home or on-the-go. Save time and money with this A to Z guide from Emmy winning podcasting expert and educator Laura Meoli. This special online presentation is available for a LIMITED TIME. 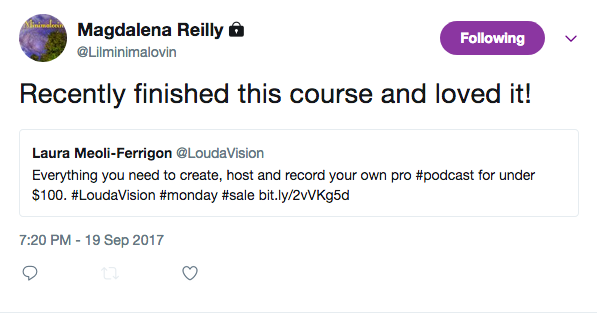 Note: this course covers interview podcast formats, multi-host panel shows and any other format of show you might be interested in creating. It gives a complete overview so you can make the best decisions and find what works best for you. I’m Laura Meoli, host of the LoudaVision Podcast for creative people. I’ve condensed 10 years of professional experience creating high-end multimedia, into this A to Z guide. Let’s get your podcast out of your head and into people’s ears! After completing the course, if you have additional questions about any of the topics covered, I will be sharing relevant blog posts on this page. This will ensure that technology recommendations and links are always up to date. Feel free to contact me with any questions you might have about the course.